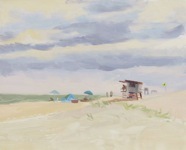 The last few years I have painted at the annual September Plein Air Events on Chinoteague and Assateague Islands, VA. Subject matter is plentiful....this past year year I painted "Tornando Warning" after the "seek shelter immediately, a tornado is in your vicinity" alert sounded on my cell phone. Life Guard Station 8"x10" oil $180. Tornado Warning 12"x9" oil $180. Late Afternoon- Assateague 8"x10" oil $180. Swan Cove 11"x14" oil $270. In the Gut 11"x14" oil $325. Skiff at Rest 11"x14" oil $325. 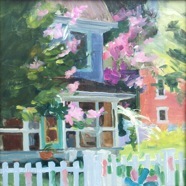 Wheel House 10"x16" oil $295. 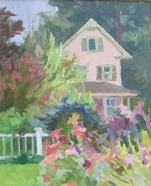 Pink House 10"x8" oil $250. Garden Umbrellas 10"x8" oil $250.